Henry Coxwell, an English dentist, was born Mar. 2, 1819. Coxwell flew in his first balloon when he was 25, and he quickly acquired a second career as a professional balloonist, making hundreds of ascents for pay from such pleasure palaces as Vauxhall Gardens and Cremorne Gardens in London, where people would pay admission fees to watch balloon ascents (and other less salubrious activities). 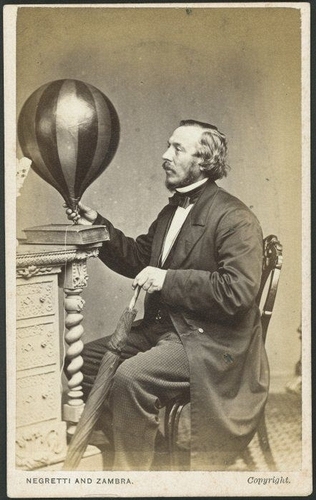 Around 1860, he met James Glaisher, a meteorologist and member of the Royal Society of London, who was interested in upgrading ballooning from a pleasure sport to a scientific enterprise. Armed with barometers, thermometers, hygrometers, and other instruments, but with no balloon (and no ballooning experience), he persuaded Coxwell to build a new balloon suitable for a record altitude ascent. Coxwell responded with the largest balloon ever constructed, with a capacity of 90,000 cubic feet of gas (it had no name at the time, but would later be called the Mammoth). At this time, most balloons used coal gas for buoyancy, which did not provide as much lift as hydrogen, but was much safer. Therefore Coxwell decided to launch the Mammoth from Wolverhampton, in the West Midlands, where there was a large coal-gas plant. 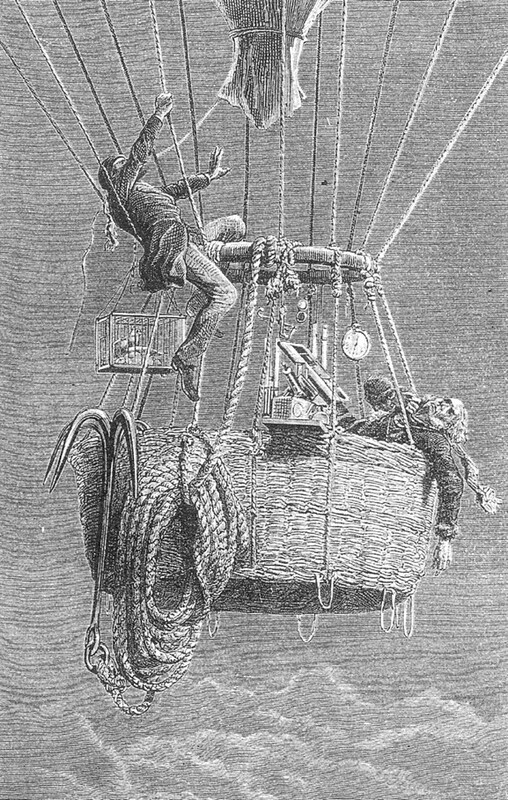 Coxwell and Glaisher made two preliminary ascents to test the instruments; in the wood engraving above (second image), you can see them in the basket, Coxwell being the one not surrounded by instruments. The first ascension reached 26,000 feet; the second, 24,000 feet; everything worked well, and so they decided to try for the record. On Sep. 5, 1862, they took off from Wolverhampton, and they were 5 miles up in less than an hour, with Glaisher furiously measuring the temperature and atmospheric pressure as they rose. Indeed, the barometric reading was the only indicator of altitude, as altimeters were instruments of the future. Glaisher last consulted the barometer when it read 9 3/4 inches, corresponding to an altitude of 29,000 feet. Shortly before, he noticed that he could no longer read the fine markings on any of his instruments nor the time on his watch, and shortly afterward, his vision tunneled out and he became senseless, although not quite unconscious. The balloon kept rising, and Coxwell realized that he needed to open the gas valve to initiate a descent before he passed out as well. Unfortunately, he had lost the use of his hands, so just in time, he seized the valve cord in his teeth and, with several jerks of his head, was able to open the valve and stem the balloon’s ascent (first image). Perhaps his dentistry experience served him well in this critical situation. How high did they get? Since the balloon was rising at 1000 feet per minute just before Glaisher lost his sensibilities at 29,000 feet, and there was a considerable lapse of time before the cord was pulled, Glaisher later estimated that they had risen to 37,000 feet, although for the record, he offered the more conservative figure of 32,000 feet, which is probably closer to the mark. Take whichever figure you choose; both of them yield a higher altitude than anyone else had risen to without the help of oxygen, before or since. 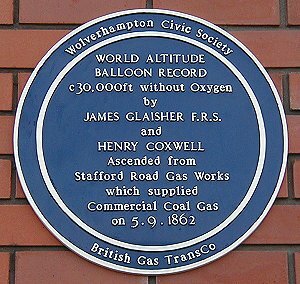 A blue plaque in Wolverhampton, on the front wall of the coal-gas works, commemorates the ascent (third image). The carte de visite above (fourth image) was made about the time of the great ascent, and shows Coxwell with a model of his balloon.